Thanks to my daughter’s 4th grade science fair project, I had a large quantity of romaine lettuce on my hands recently. She was comparing how well different vegetables regrow. If you haven’t tried to regrow veggies with your kids at home, I highly recommend this as a fun project. Lots and lots of produce can be regrown in your windowsill – lettuce, celery, onions, potatoes – but she was wondering if it mattered if the produce was organic or not. For everything except the romaine lettuce, the organic regrew so much better than the conventional produce… Shocker? My kids love to order caesar salads when we go out to eat but, for some reason, I never make caesar salads at home. Probably because my idea of salad dressing involves vinegar, oil, garlic, salt … shake, shake, shake. Easy peasy. Little did I know that I could make a creamy caesar dressing with almost as little work. We made a huge batch of caesar salad for lunch on Saturday – two heads of romaine lettuce for the six of us – and we used almost all of the dressing we mixed up. While I was prepping the dressing, I had the girls making the crispy, crunchy croutons. They are pros. I keep a bag of the ends of gluten-free loaves of bread in the bottom of the refrigerator. If I need bread crumbs or homemade croutons, we grab a couple of slices out of the “scrap bag” and chop them up. The girls season the chopped bread with a tawdry assortment of seasonings and then add olive oil and then – the best part – mix it all together with their hands. 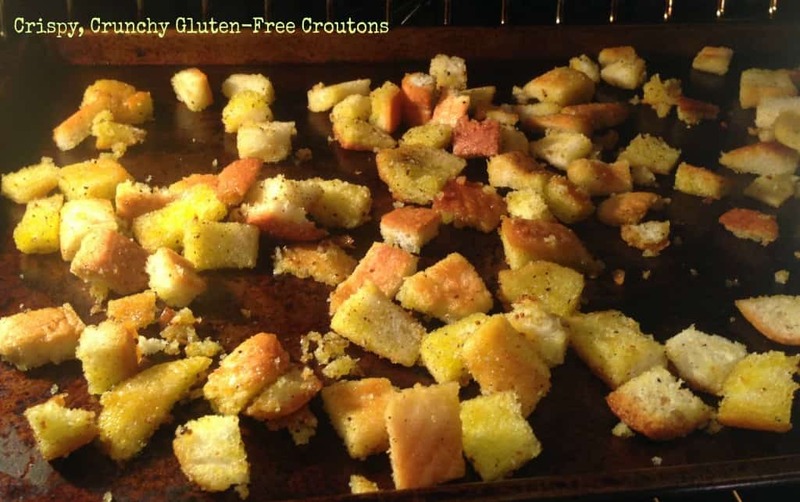 The croutons only take 5 to 10 minutes to toast up on a cookie sheet in a 375 degree oven. Don’t skip the croutons! For the dressing, I went to my local grocery store and searched around the cans of tuna fish to find a tube of anchovy paste. This is a key ingredient. I didn’t want to add actual anchovies to my caesar salad (wimpy, I know!) but I wanted that deep, salty flavor in there. Other than the anchovy paste, you probably have all of the ingredients you need to whip up a quick creamy caesar salad dressing. I combined all of the dressing ingredients in a mason jar and gave it a good shake – my kids also love shaking salad dressing – who needs a whisk when you have little helpers? 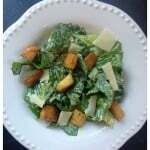 Drench your romaine lettuce in the creamy dressing, grate large slices of parmesan on top and add the crispy, crunchy croutons. Be sure to serve this in very large bowls… it will be devoured, I promise! An easy, creamy caesar salad dressing! Don't forget to add large chunks of parmesan cheese and crispy, herbed croutons. Roughly chop the romaine lettuce and set aside. Mash 6 to 8 cloves of garlic with the side of your knife and combine the mashed garlic with coarse sea salt to make a garlicky paste. Combine garlic paste, mayonnaise, olive oil, mustard, Worcestershire sauce, Anchovy paste, and the juice from half of a lemon in a bowl or mason jar. Whisk ingredients together or shake well. Add to romaine lettuce. Toss gently. Top with croutons and parmesan. Enjoy! Fantastic! I haven’t had a caesar salad in so long! It’s so simple! I am definitely a fan of the fancy salad trend but, once in a while, simple is nice! These croutons sound wonderful! All too often I find myself munching on them as if they were a snack! Caesar salad is one of my favorite types of salads. Yours looks delicious. Growing your own vegetables is such a great thing to share with our kids. We do it too. It’s so cool to know you can eat what you grow. Thanks, Ali! I think growing veggies with kids has such a positive impact in so many ways! Caesar salad is my favorite! When I go out I always order it up but never made it at home. This must change! I don’t know why it took me so long to make this at home! Now I make it as an easy side for dinner parties, too… 😉 It’s always devoured. 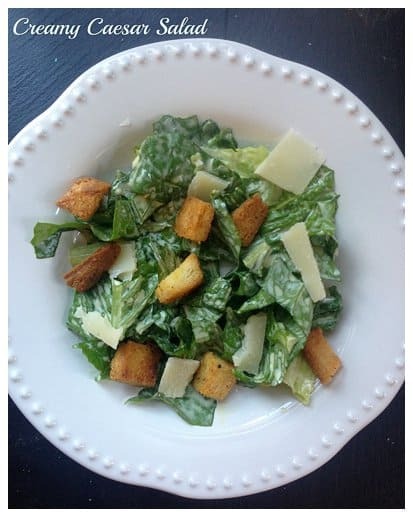 I love a great Caesar salad and the croutons are my favorite! I have often used cornbread for the texture! I haven’t tried a gluten free bread yet. I am so intrigued! I can’t wait to try!